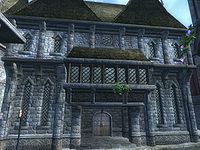 Summitmist Manor is a large house located in the northeastern part of Skingrad, just west of the east gate. It is situated beside Nerastarel's house and across from Toutius Sextius' house and Rosethorn Hall. The guests that reside in the manor are Primo Antonius, Dovesi Dran, Matilde Petit, Nels the Naughty and Neville. It contains three zones, Summitmist Manor, Summitmist Basement and Summitmist Living Quarters. Whodunit: Summitmist Manor; there were six on the night of last and then there were none... save one. Este artigo relacionado a Oblivion é um rascunho. Você pode ajudar expandindo-o. Esta página foi modificada pela última vez à(s) 23h43min de 31 de maio de 2015.